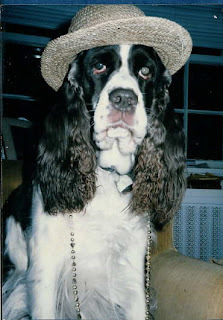 The theme for the 50th edition of the Carnival of Genealogy is family pets. There are six pets I would like to honor, though I don't have a photograph of three of them. I've mentioned Daisy before. She looks a little less like a bear in this photo. Most bears don't wear pajamas. Most dogs don't either, unless there are creative, but slightly cruel children about. Daisy joined the family a year before I did. I am told she was jealous at first of all the attention the new baby got, but soon she learned I meant more table scraps. She was half-springer spaniel, half-poodle, and a scholar-athlete. She leapt over the backyard fence within hours of coming home from her early surgical procedure. She was always a runner, but she loved riding in cars, so once she got away you wouldn't be able to catch her, unless you were in a car. Then she would gladly jump in. Any car. Watching my brother, sister and me come inside after playing in the backyard, she saw us ring the doorbell, and how the door miraculously opened. At least, that's what we think went through her mind, because she decided to give it a try. I'm told the first time she did it, my mom went to the back door, looked around, saw just the dog, and shut the door. When it happened 10 seconds later, she opened the door, and then Daisy did it live for her. We'd put her outside in the back during dinner parties, and then have to explain to the guests when the doorbell rang, "it's just the dog." I heard last night a story told that one day she got loose and ran, and we couldn't find her in the neighborhood. She returned home at 2 am, jumped the backyard fence into the backyard, and rang the bell. Daisy died when I was in sixth grade. Molly was our next dog. She was all Springer Spaniel. She didn't ring the doorbell, though we did try to teach her. What we didn't realize is that every dog has to find their own trick. She learned how to play the piano. We didn't immediately spay her. It was the 1980s, and the spay/neuter crusade hadn't really hit full-force yet. We decided we would wait until after she had puppies. We found a professional breeder with a stud, and Molly had a litter of 8. 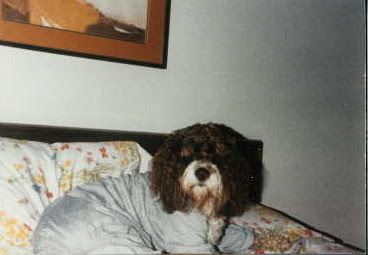 While we had prepared a comfortable bed for her to have the puppies, she chose my bedroom, where she would often sleep at the foot of the bed. (Not a surprising choice, actually.) We got her to the room we wanted her between puppies 2 and 3. I was home after college when she died. Benny, another Springer Spaniel, followed. My parents decided they didn't want to spend the time training a puppy, so they found a 1-year old from a breeder. Apparently a family had bought him, but the check bounced, and they ended up returning him. The breeder was sure she would have to keep him herself, until we came along. I thought we should name him Bouncer, but we kept the name the breeder had given him. While I spent a couple years in the same house as Benny, I did move out, and he was the first pet that I saw grow up from afar. The picture above isn't the most flattering. Benny liked the pool, but mostly as a large drinking bowl. He wasn't a fan of swimming. 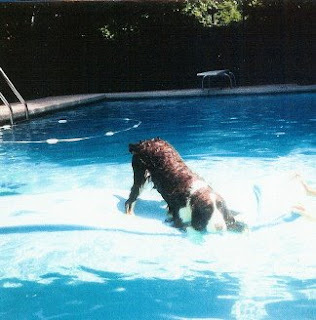 This surprised us since we figured all Spaniels by nature should be attracted to water, but every dog is an individual. Here he is riding on a raft, and drinking from the pool. I had three other pets as a child. They were mine, and only mine. They were a trio of hermit tree crabs. I don't think a photograph was taken of them, or at least, I don't have one in my collection. I named them Sabrina, Kelly, and Jill. If you grew up watching television in the 1970s, like I did, you probably know who I named them after. So you had a Charlie's Angels of hermit crabs! That's pretty original! Love the pictures of the dogs!